Shocking Video of 'Abortion Doctor' Saying He 'Loves Killing Babies'? - Truth or Fiction? 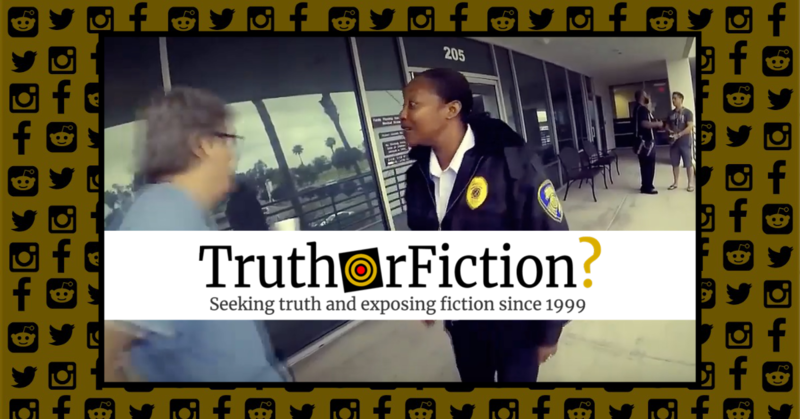 A Facebook video purportedly shows an abortion provider behaving strangely, but it is old, misrepresented, and was resolved years before its recirculation. Video shows an "abortion doctor" stating that he "loves killing babies." Both shares were accompanied by titles or captions that stated the unidentified man said he “loved killing babies.” However, that was not a direct quote from either clip. In both, a person off-camera (presumably an anti-abortion protester) is approached by a man in blue medical scrubs. The second man is drinking a cup of coffee, and he quickly moves to a slightly off-camera position. For most of the video, his torso is visible, but his face is only seen in scattered, seconds-long portions. However, the overall impression one gets watching the clip is that the man in scrubs is perhaps satirically mirroring how he believes the protester sees him. In the background, a female security guard laughs at the interaction. A security badge is visible around the man’s neck, reading “SHARP” (presumably the name of the facility). In the YouTube iteration, the description box claims the man in scrubs is named Robert J. Santella. It did not take long to locate a news story in San Diego about the video and Santella, but neither February 2019 version mentioned that the video had long been circulated and handled by the parties involved. A longtime San Diego physician will close his medical practice December 31 , and will not challenge accusations of gross negligence in patient care, and unprofessional conduct, during an altercation outside a local abortion clinic. The Medical Board of California detailed those allegations in a 25-page accusation filed July 17  against Dr. Robert Santella. The Medical Board claimed Santella over-prescribed narcotics to six patients and botched an abortion on another patient. The Board also cited Santella’s “aggressive” and “outrageous” behavior outside the Family Planning Associates abortion clinic on Miramar Road in June 2016 as a cause for revoking his license. That confrontation was videotaped by two abortion protesters, including Zephaniah Mel, who went face-to-face with Santella outside the clinic entrance. The video shows Santella approaching Mel with a pair of scissors in his right hand. Santella’s attorney, Bob Frank, said because of the camera’s angle, there is no video footage of the confrontation that supports Mel’s claim that Santella threatened him with the scissors … In the accusation, the Medical Board’s executive director said Santella’s “outrageous conduct” and “physically threatening gestures” violated his profession’s ethical code, and demonstrate Santella is unfit to practice medicine. While Frank maintained he believed Santella could successfully dispute the sanctions, he also indicated that the time and expense involved was a major disincentive to do so. Santella spoke to KNSD, saying he “lost his composure” and expressing regret for his actions. The video was undoctored and authentic, but neither new nor actively suppressed in February 2019. In the clip, Santella did not say he “loved killing babies,” but he did respond to the protester’s assertion in the affirmative. Iterations of the clip were shared in June 2016, and used as a basis to (successfully) oust Santella from a San Diego clinic. Santella faced disciplinary action due in part to the events portrayed, opting to surrender his license rather than dispute the allegations. Were Modern Caesarean Sections Invented in Africa? Did a 38-Year-Old White Active Duty Naval Officer Assault a Black Middle School Student?